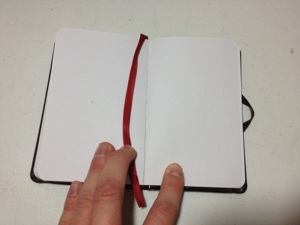 So, you’re out and about, you’ve just finished your last pocket notebook and are looking for a new one. You happen across one. It’s got 80 sheets of thick sketch paper and is only a couple bucks. 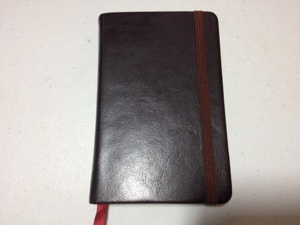 It even looks kinda nice in its faux-leather binding. Is this small Escalada journal a good buy? Let’s see. We’ll start with the binding. It’s surprisingly good, it flexes well and doesn’t break under standard usage conditions. The binding, as well as the cover is of course cardboard covered in faux-leather with a slightly unattractive sheen. This layer holds up alright, though it does start to peel and rub off at the corners which is very unsightly. It also gets gummy in high temperatures and begins to take the shape of whatever is next to it, so where the elastic band is there will be a permanent set of grooves. But it hasn’t melted or gotten sticky in the time I’ve used it and I live in the middle of the desert. The paper is 80 sheets of 74 lb drawing paper. It’s thick but flimsy, it feels as if it’s falling apart sometimes and ink bleeds through and can be easily seen on the other side in some cases. Yet I have had no instances of marking on the next page. It has an easily visible grain and does at times warp ones drawings, mostly pencil though and not very much. The roughness is a bit unsightly to me but that’s just personal preference. Despite the flimsy feeling of the pages they are very stout and remain ridged most of the time. They resist bending, however I feel that if they did bend they would soon fall apart. It’s an alright pocket sketchbook. It’s cheap, both in price and manufacturing, but it does do its job well enough. Just carrying it in a bag or a case won’t do much harm to it, especially since it only has eighty pages and can be run through fairly quickly. However, if your life is a bit more rough and tumble than most this is not for you, it will look ugly shortly and fall apart not long after. It does best if you’re looking for a notebook to store in your bag or somewhere on the cheap and don’t have too much preference as to the quality of the content you put in it.